The DH400 High Pressure Flex Tubes are constructed of a polyamide core tube with a high tensile, reinforced synthetic fiber and polyamide outer cover. 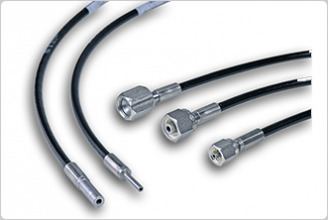 These flexible tubes are used in systems where high pressure flexible connections are needed to facilitate frequent make-and-break operations, allow individual movement of components under pressure, and/or withstand high frequency vibration. at maximum operating pressure. Burst pressure of 20,000 psi (138 MPa) provides a 3.3 margin with operating pressure. Inert to ozone and ultraviolet and compatible with an extremely wide range of liquid and gas media, and negligible humidity absorption these tubes are suitable for use in a wide variety of conditions and environments. No derating of operating pressure for temperatures from -30 °F to 212 °F (-34 °C to 100 °C). Lightweight - Tube weight is only 0.5 oz/yd of length (16 g/m). Working Pressure - Up to 6 000 psi (40 MPa). Flexibility - Bending radius of 15/16 in. (2.4 cm) at maximum operating pressure. Temperature - No derating of operating pressure for temperatures from -30 °F to 140 °F, (-34 °C to 60 °C). Safety - Burst pressure of 20,000 psi (140 MPa) for a 3.3 margin with operating pressure. Lengths for each tube configuration are standard. Other non-standard lengths are available up to 300 ft (90 m).